With its international flair, Amsterdam has food for all tastes. Here’s a look at the Dutch capital’s culinary delights. From local specialties to global influences, here’s a look at some of my favorite places to refuel in Amsterdam. Amsterdam is teeming with cute cafes that serve delicious breakfast food, but I will only mention my favorite: Bakhuys Amsterdam. This warehouse-style bakery consists of a large open space with not only tables and counters, but also the kitchen and bakers, so you can watch the masters at work. Here, you can choose any breakfast drink or food, savory or sweet – from warm pastry to freshly baked pizzas, and much more! Once you’ve digested breakfast, it’s time to for a proper meal. If you’re into exotic food, you must check out Rainarai and Bazar. 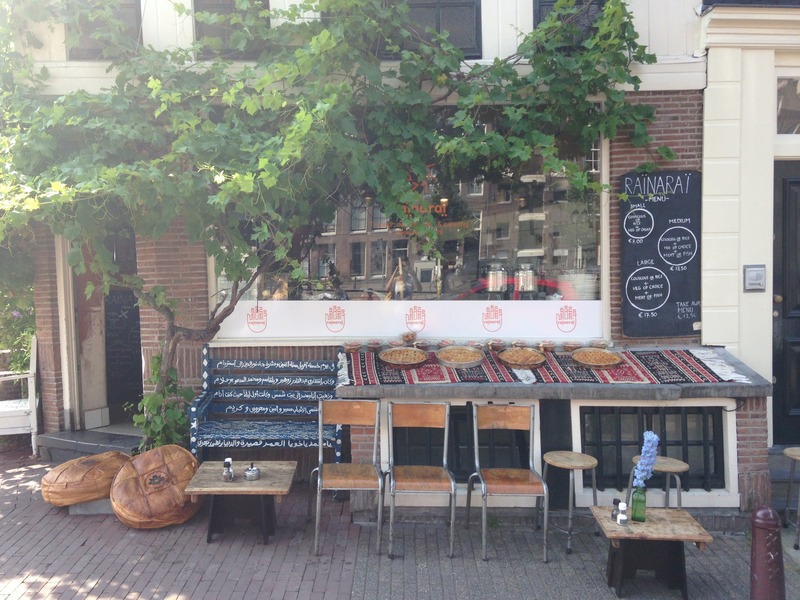 Rainarai is a small and cute Algerian restaurant located in Jordaan, one of Amsterdam’s most beautiful neighborhoods. The restaurant offers a number of specials in addition to the standard dishes, so don’t be afraid to speak up and ask for suggestions…the staff is super friendly! You will find a variety of main courses (and many vegetarian options!) cooked with the traditional North African flavors and herbs, all served with couscous. If the weather is nice, you can take your meal outside sitting on a pillow right in front of the canal. 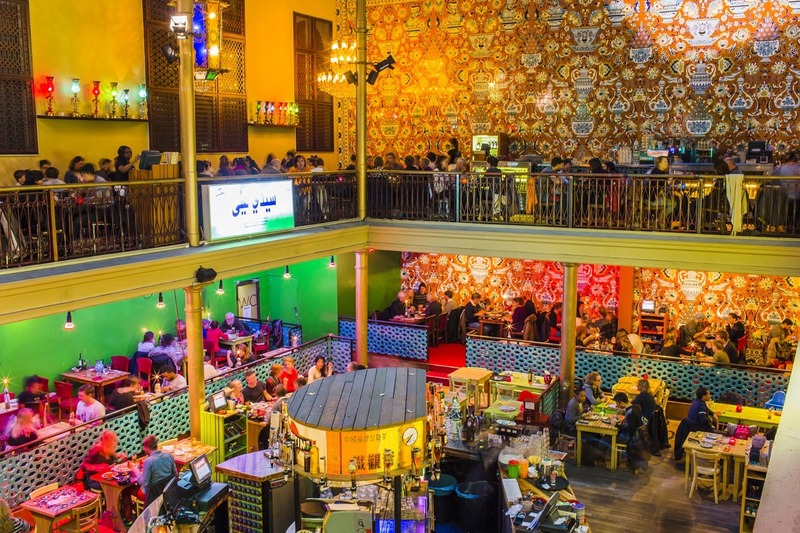 Bazar is located in the gorgeous De Pijp neighborhood inside a stunning converted church. When you get inside, every detail will strike you, from wonderful lamps to colorful tiles all around. The only thing that beats the stunning location is their food: all sorts of African and Middle Eastern dishes, served in beautifully hand-drawn plates. I suggest you and your food companion(s) share one of the large lunch/dinner platters, which include loads of different food and will save you the struggle of choosing among all those treats. If you’re not looking for exotic flavors, why not try some good ol’ trustworthy burgers? In that case, Lombardo’s is the place to be. This tiny place in the heart of Amsterdam is the home of Amsterdam’s best burgers. They have top quality meat to suit the needs of any burger lover, as well as super tasty vegetarian options. The place is very small though, so try to avoid peak times if you want to sit inside. Chances are that after walking around the city center (especially if you paid a visit to the local coffeeshops), you’ll want to stop for a snack or a dessert. 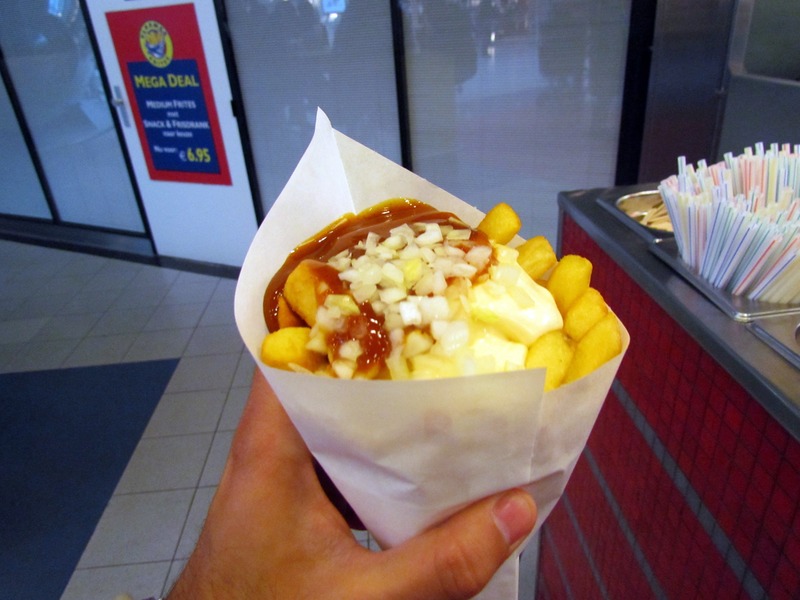 Every tourist in Amsterdam has to try the fried chips, sold in any snackbar around the center; a typically Dutch choice would be to order patatje oorlog, chips served with peanut satay sauce, mayo and onions. Another traditional snackbar food is the kroket, a breadcrumbed fried roll that contains mashed potatoes coupled with anything from meat to fish to vegetables. Walking around, you’ll notice that some snackbars have a wall with a collection of food behind glass doors; you’ll just need to insert some coins then select your snack of choice! On the other hand, if you prefer something sweet, then you gotta try stroopwaffels or poffertjes! Stroopwaffels are made by squeezing two layers of baked dough together, with syrup in between; poffertjes are like small pancakes, usually topped with sugar, syrup or nutella. To try any of these treats, I suggest you go to Albert Cuyp Market, a beautiful street market where you’ll find stands that prepare these beauties on the go, nice and warm. Finally if you want to make a proper meal out of the dessert, go to Pannenkoekenhuis Upstairs. Here you’ll find all sorts of delicious pancakes – savory, sweet, or a mix of both. My favorite is the one with bits of bacon inside the dough, topped with cheese and fresh fruit; it might sound weird but it’s just amazing. Besides the food, what makes this spot so special is the place itself, a sixteenth century house. To access the restaurant, you must go through a steep and tight staircase that leads you to the small space upstairs, where you can find traditional Dutch pottery hanging from the ceiling. It only has four tables though, so make sure you book your spot in advance!